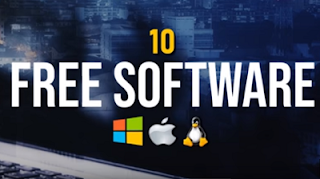 These are 10 free software for your computer that are very useful. Beginning with this edition of the “Free Software” series and future episodes to come, we’ll take a look at the best free and open source programs for your computer. In short, when you see the term “open-source software”, it means that it’s source-code is freely available for users to inspect, modify, and distribute the software to anyone for any reason. With so many free and open-source programs that are actually great, in this video I will show you 10 of our personal favorites that we think are the most useful, many of which you’ve heard me discuss before on this channel. They’re all well-established, trusted and completely free.